LAKE FOREST, Ill. (AP) — Chicago Bears quarterback Mitchell Trubisky was listed as doubtful Wednesday for the Thanksgiving Day game in Detroit against the Lions. 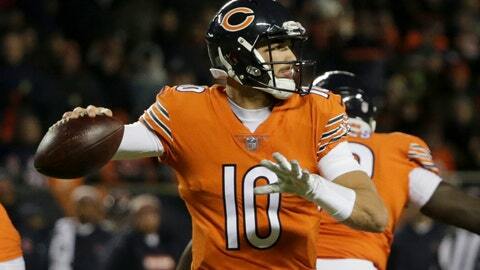 Trubisky suffered a right shoulder injury in the fourth quarter of Sunday night’s 25-20 win over the Minnesota Vikings. If he can’t play, the Bears will turn to backup Chase Daniel, who has not started or played extensively in an NFL game since 2014. At 32, Daniel is the oldest player on the Chicago roster and hasn’t thrown more than two passes in a season since 2014 in Kansas City. He does have extensive knowledge of the Bears’ offensive system run by former Chiefs assistant and current Chicago head coach Matt Nagy. Earlier this week, Chicago offensive coordinator Mark Helfrich said he saw no reason for play-calling to be altered should Daniel play. The Bears (7-3) have won four straight games. Detroit (4-6) is coming off a win over Carolina after three straight losses.